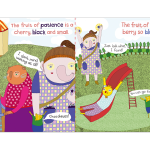 The JOY Book gives small children the tools they need to build happy, healthy relationships. It teaches them about the 9 fruits of the Spirit: love, joy, peace, patience, kindness, generosity, faithfulness, friendliness and self-control. More importantly, it also teaches them how to share these values with others. 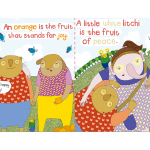 The JOY Book serves as a compass for fruitful living and helps children understand what matters most in life. The JOY Book was written by Andrea Buchanan. Andrea previously wrote for children’s publications such as Little Village and Takalani Sesame South Africa. Before moving to London in 2013, she volunteered at the Vineyard House in Kayamandi, where she shared her love of reading with foster children while helping to improve their own reading skills. The vibrant, colourful illustrations are by the talented Xanele Puren. Xanele is the co-founder of See-Saw-Do – a non-profit organisation that focuses on the physical transformation of the spaces in which children develop, as well as on the production and distribution of mother-tongue reading material to these facilities. 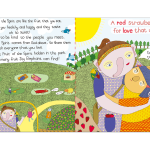 This lovely book is available in the original English by Andrea Buchanan, as well as in Afrikaans (translated by Elize Ras) and Xhosa (translated by nguDeon Nebulane), making it even easier to share with friends from different cultures. Contact us to order your copy of The JOY Book for R130 (excluding shipping costs).